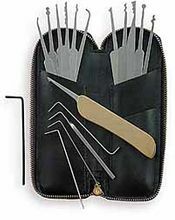 The Journeyman 17 piece lock pick set is one of the finest available made by Southord. Comes with an assortment of picks -- everything necessary to pick any pin-tumbler lock--and includes a fully machined, precision metal cast, interchangeable alloy handle.. This set is versatile, durable, and includes a rugged luggage quality zippered leather case. This set is versatile enough for experts.